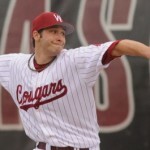 Arnold helped Washington State make its first NCAA Regional in nearly 20 years in 2009. The right hander tied for the Cougar pitching staff’s team lead with 8 wins, and he struckout 10 in an NCAA Regional elimination game win over Wichita State. He talks with Sean Stires about that as well as Washington State’s new attitude heading toward 2010.